Hopefully, everyone had a great time at our Blue and Gold Banquet! It was a fun evening and is always so exciting to see the scouts receive their rank badges … and a bit emotional sending our Webelos 2 off to Boy Scouts! Congrats to those five scouts on their next chapter in scouting! All scouts in attendance will receive a Blue and Gold patch at our March pack meeting. Did you leave something behind at Blue and Gold? Nancy V. ended up with various uniform parts, scout gifts (water bottles), etc. Let her know if you are missing something! Did you bake a cake? If so, please inform the Advancements Chair, so a Cake Bake Patch can be ordered for you! These are the noted being seen. Please let Nancy V. know if you are not on the list! Wondering where to put that new badge and arrow points? Please see the attached guide and feel free to ask the awards chair if you have any questions (Nancy V. pays Children’s World $3 per patch and they know exactly where to sew it on)! You may be thinking … now that my scout has his rank badge, what is next? For the remainder of the year until Crossover in May, Tigers, Wolves and Bears work on their electives to earn beads (Tigers) and arrow points (Wolves and Bears). 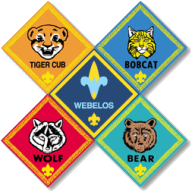 Webelos keep working on Activity Badges. The Advancements Chair will be awarding beads and arrow points at the March, April and May pack meetings. After that, you move on to your next rank and it all starts again! Spring Break is right around the corner! Check out the Family Travel Belt Loop if you are going on a trip … a great, easy way for your scout to earn this belt loop. Remember, you can work on belt loops and pins as well as electives on your own outside of den meetings. Just work with your den leader on the requirements he/she has for showing the work. Here is the link to the belt loops page. Simply click on the belt loop and it will show you the requirements. That’s all for now! A lot more fun things coming up this spring … NASA Camping, Earth Day Camping, Cub-O-Ree and Raingutter Regatta (Pinewood Derby with sailboats powered by your lung power and a straw!) just to name a few! It all culminates with our Crossover Ceremony on Saturday, May 17th when the scouts officially graduate up to their next rank. Have a great week! And, as always, Nancy V., the Advancements Chair is here to answer any questions you may have.